Harbour Place may have one of the best views of the waterfront traffic on the Piscataqua River and the Memorial Bridge in all of Portsmouth. This shot was taken from the balcony of the building next door. 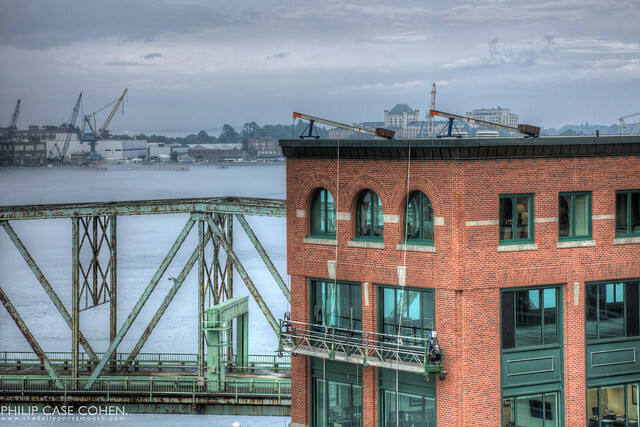 I was fascinated by the window washing equipment set up on the side of the building that I’d never noticed previously…and love the rich tones of the sky with the cloud cover and the Portsmouth Naval Shipyard in the distance. A wonderfully foggy afternoon. I like the way the bridge comes out from behind the building, and if you look closely you can see parts of it through the windows.